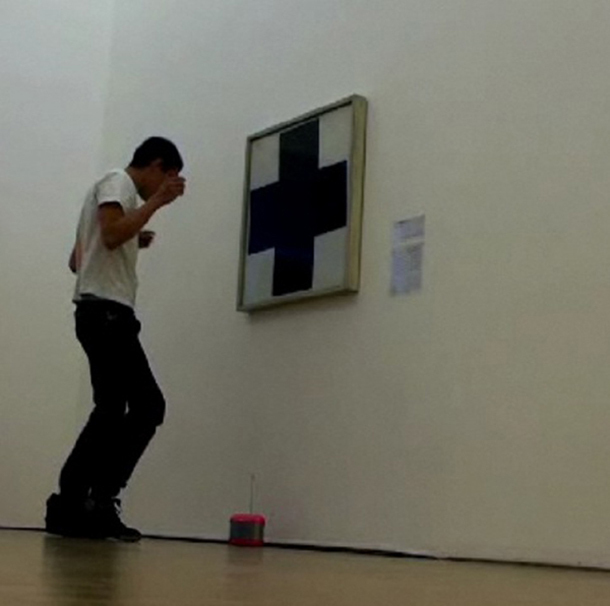 A person dances in front of a painting. He is dressed simply in a white shirt and black pants, like the painting, with its black cross and white background. Sometimes life and beauty are simple: to look at this person dancing in front of a painting is beautiful, and makes our hearts dance along too. 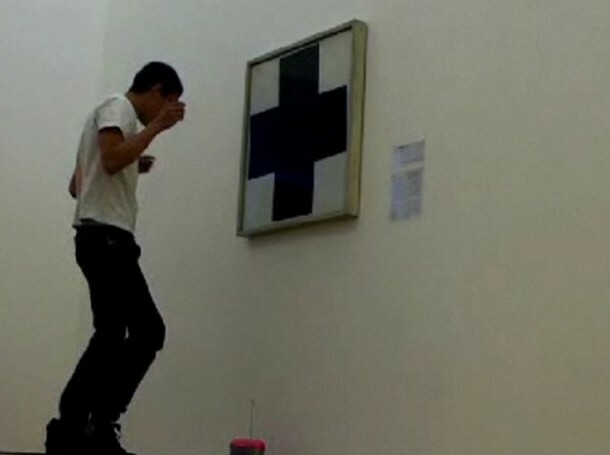 The person dancing is artist Ivan Argote, and he dances in front of Malevich’s Black Cross. Ivan’s gesture can be seen as an extension of the painting, the painting brought into the real world, one of feelings and emotion, with a joyous everyday feeling, like if a character in a Dostoevsky novel stepped out of the book to share with us an ice cream. Or, this could be a comment, a reaction, a gesture against the abstractions of 20th century art, and its closed, chilly hermetic silence. The brass section of the song that plays, and guides Ivan’s body, is reminiscent of a New Orleans funeral march. The little radio he smuggles into the museum happens to channel from up above the song “Close to Me” by The Cure. Through chance or destiny, this song is a perfect collaborator. The small radio box is paralleled by a small Malevich Black Cross to the right of the scene. The world and this video contain amusing coincidences. Tension builds each time a person is seen to the left, walking through the outside room, or hovering near the entrance of our room. We are afraid that the outside world will interfere – the same outside world that provides the music for this moment can also materialize to crush Ivan’s reverie – but this fear dissolves as people wander obliviously or respectfully into the particularities of their own lives, leaving us close to Ivan, and whatever it is he is doing: dancing, performing, acting, living, loving, attacking, joking, dreaming.